Create the perfect man cave or entertainment space with this power reclining sofa with power head rests. The sofa features two reclining seats that let you kick back with the touch of a button. Pillow arms and pad-over-chaise seats create a plush, supportive experience for comfort from head to toe. Contrast stitching adds an element of sophistication to this perfectly casual reclining sofa. 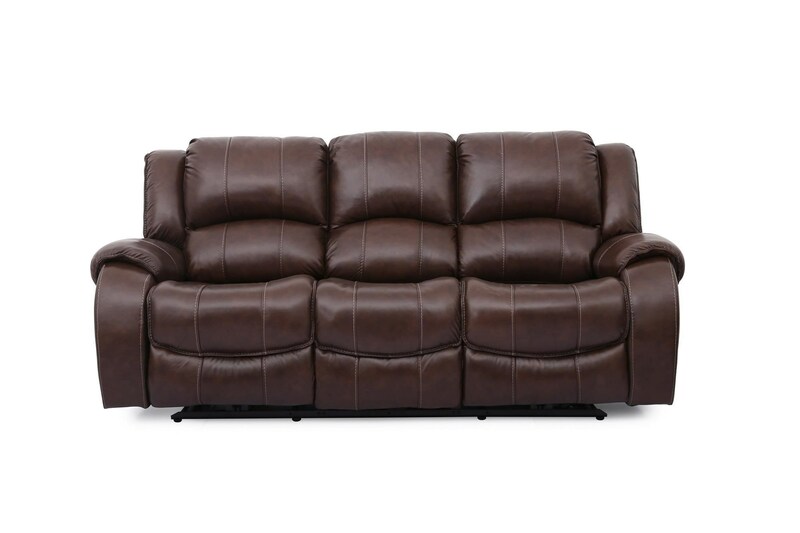 The Evan Brown Leather Power Reclining Sofa with Power Headrests by Cheers Sofa at Great American Home Store in the Memphis, TN, Southaven, MS area. Product availability may vary. Contact us for the most current availability on this product. Promoting comfort and relaxation, the UXW5233HM Evan power reclining collection is perfect for your family room or lounge area. Pad-over-chaise seats, pillow arms, bustle backs, and power head rests give the sofa, recliner, and loveseat in this collection elements of comfort and sophistication fit for a variety of occasions. A favorite among those who love to entertain, you can't go wrong with this addition to your home. The Evan collection is a great option if you are looking for Casual furniture in the Memphis, TN, Southaven, MS area. Browse other items in the Evan collection from Great American Home Store in the Memphis, TN, Southaven, MS area.